← Focus on the positive. This morning, I gave into my oatmeal craving, and my need to eat an apple that was about to go bad, and made oatmeal for breakfast. It made me a little late, and it took a lot longer than I anticipated, but it was SOOOOO delicious. I cut the apple up without skin, and put it in a pan with coconut oil, cinnamon, splenda brown sugar, and a quick splash of lite maple syrup. I let that soften and sweeten while I did everything else, with the oats, and getting ready stuff for the morning. I made Kath’s Whipped Banana Oats, which truly is the best oatmeal ever. I added chia seeds. 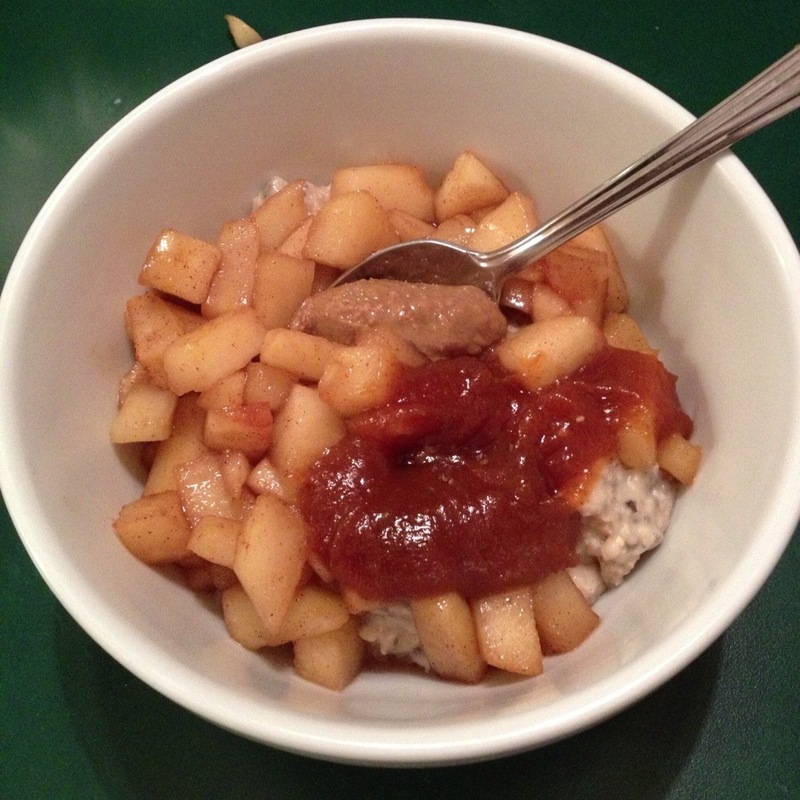 Then, I put half the apple mixture in the bowl, the oatmeal on top, then the other half of top of the oatmeal. I also added a dollop of sunbutter, a dollop of pumpkin butter, and a few white chocolate chips. And it kept me full for a really long time. It was a LOT Of calories, so I am glad it did, but it was several hours later that I was hungry again. I actually just had a protein bar for lunch at 3:00ish, and am now getting hungry for dinner. Here’s a picture of my oatmeal. I posted it on Instagram without a description, and my cousin’s guessed it was oatmeal, almond butter, and sri racha sauce. Ha. Ha. She is funny. Off to dinner with my favorite guys – my dad, my husband, and my brother. And, my favorite 7 year old. This entry was posted in Uncategorized and tagged breakfast, dinner, filling, hungry, oatmeal, protein bar, pumpkin butter, sunbutter, whipped banana oats, white chocolate chips. Bookmark the permalink.